I love making things (as you can tell from this blog), so when I come across something that I can't make, it bugs the heck out of me. Macarons have been one of those things. I have tried with several (count 5) failed attempts to make these cute little cookies, each time with no success. 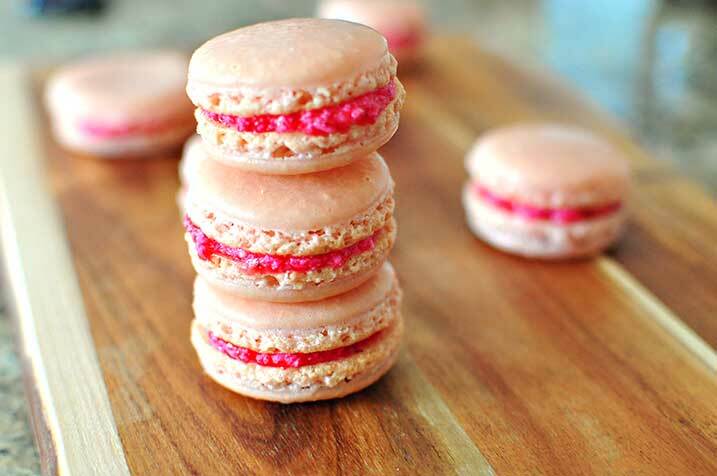 The thing about macarons also is that they are so time consuming to make and the ingredients are fairly pricey. A batch takes about three hours of elapsed time to make (at least for me) and a small bag of almond flour is 10 dollars, so each failed attempt is so frustrating. Every time I make a batch I tell my husband I'm never making these again. I took a day off yesterday and spend the entire day crafting with Avery. We made lots of fun crafts, bows and barrettes, animal necklaces, and to end the day I decided to try my hand at making macarons one last time. Finally, they turned out! They still aren't perfect, the middle is slightly chewy and the tops are a browned and not completely smooth (almond flour was too course). But I managed to have feet (those crumbly things on the side of the cookie) and taste pretty decent. I was so surprised they turned out I didn't know what to fill my macarons with. I didn't even have ingredient to fill them because I was thinking it would be another throw out batch! 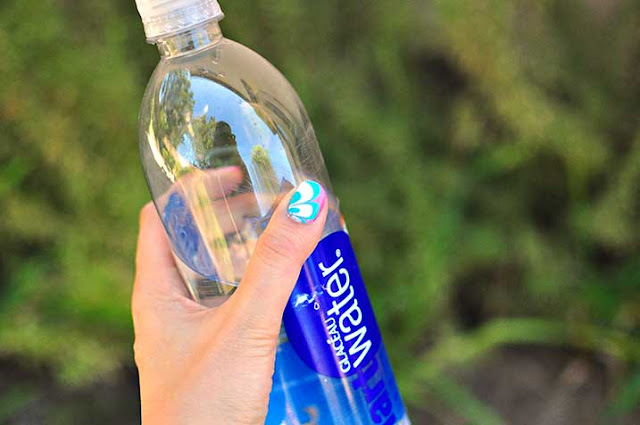 What Type of Water Do You Use To Water Marble Nails? I get this question a lot on my youtube video. Everyone seems to have different opinions, on which water is best and the right temperature. For this experiment I used three different types of water: bottled, tap, and filtered tap. The filtered tap was run through a Brita Filter. I live in Southern California so I think my tap water is fairly hard (judging from the hard water stains on our shower). I documented my experiment on the youtube video below. I didn't try different water temperatures, but from my experience room temperature (~76 degrees Fahrenheit) water always works best. Water marbling is tons of fun and you get a unique look to your nails. If you want a step by step how to please watch this video: http://www.youtube.com/watch?v=-YoxnPMbVhA There are detailed instructions there. the type of water does not seem to make a difference. So have fun water marbling, and don't waste good bottled water! 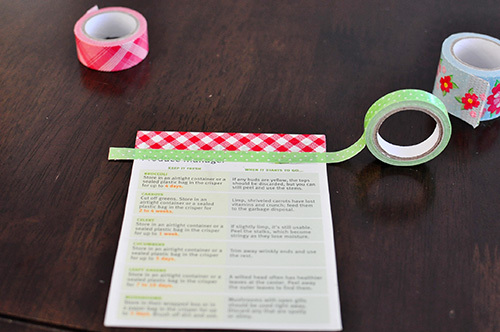 Tape over old magnetic mailer. 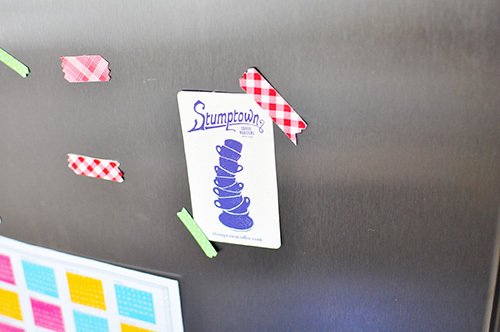 Washi tape thin to I went back and peeled off the writing off the magnet. 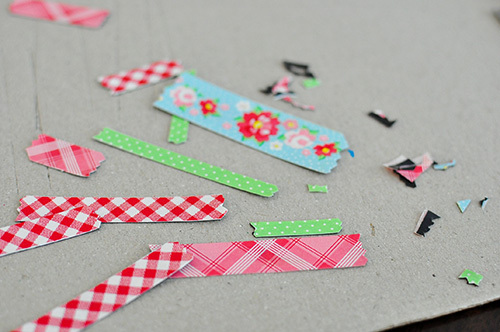 Cut the strips using craft knife and ruler. 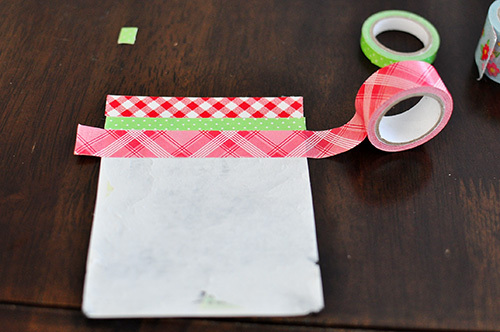 Zig zag the edges with a scissor. The more random the cuts the better. My fridge is so cute now. I should really bring these to my work to stick on my cubicle file cabinets. 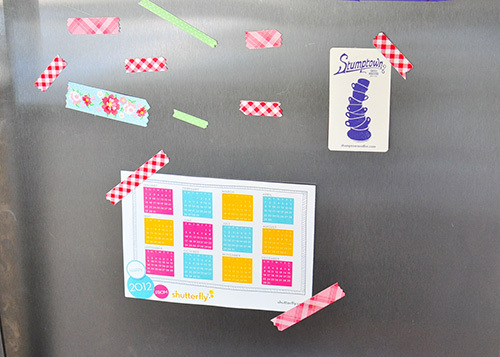 If you have lots of magnets you could also make a magnet photo collage or magnetic paper dolls. Separate Epson salt equally into ziploc bags, one for each color. Place two drops of food coloring in each bag and shake the bag until mixed. Add one drop of essential oil and then mix again. Pour into containers. 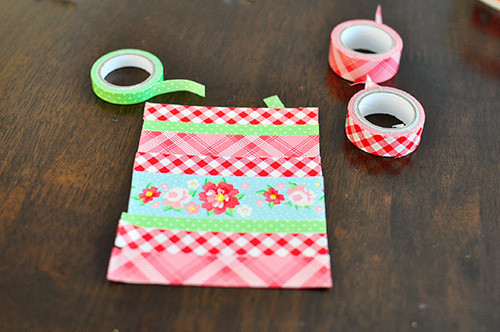 I really love this craft, it's something I am definitely going to do with my kids. They would have so much fun pouring the colors like sand art. 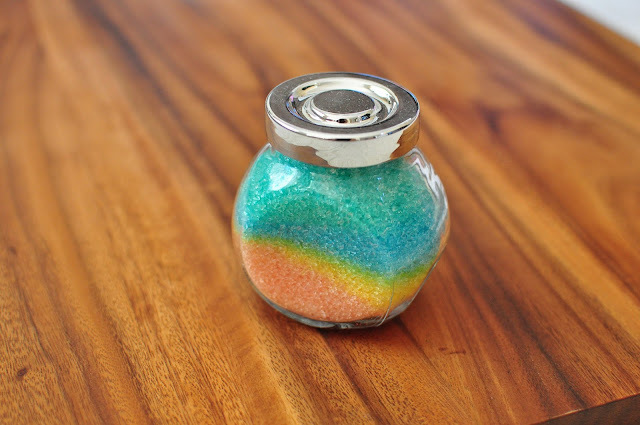 It's actually a great and useful spin on sand art. 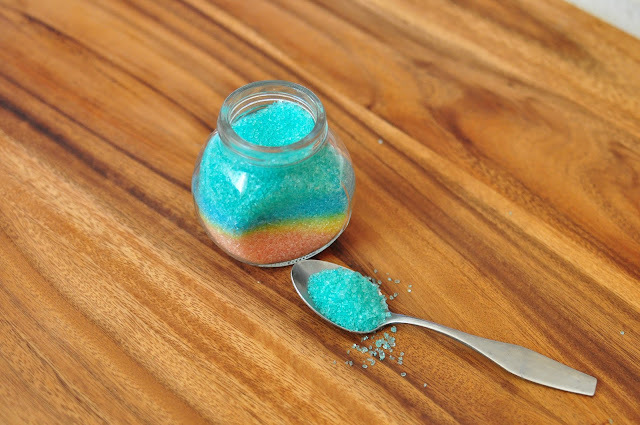 If you don't want to make rainbow bath salt you could also do this with my colored sugar tutorial. Summer always brings wonderful red ripe sweet strawberries. Ralph's had an awesome sale on strawberries. Just 88 cents a pound! This season the strawberries have been on sale at so many different markets I just had to take advantage of the great deals. I bought strawberries to freeze for smoothies, eat fresh, and make jam. 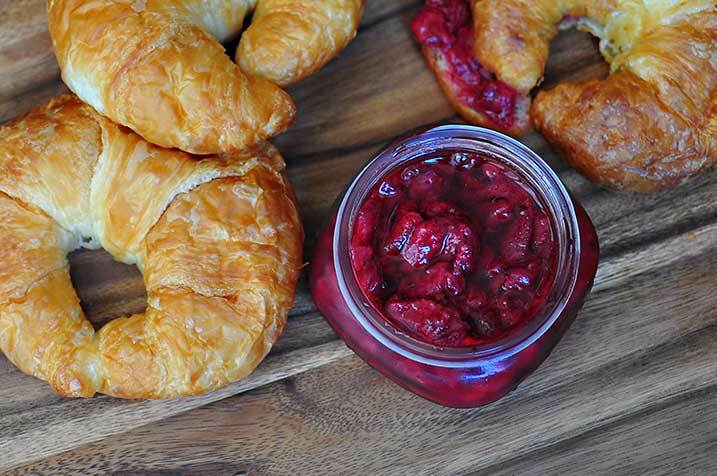 Strawberry jam is so easy to make. I have tried a few different recipes, some calling for pectin, or lemons. I usually find that the recipes with lemon are too sour and some of the recipes add too much sugar. I like using white sugar, but brown sugar adds a depth of flavor that I like. I came up with a recipe that uses a mixture of brown sugar and white sugar and is less sweet than normal jams. Wash and hull 3 lbs of strawberries. 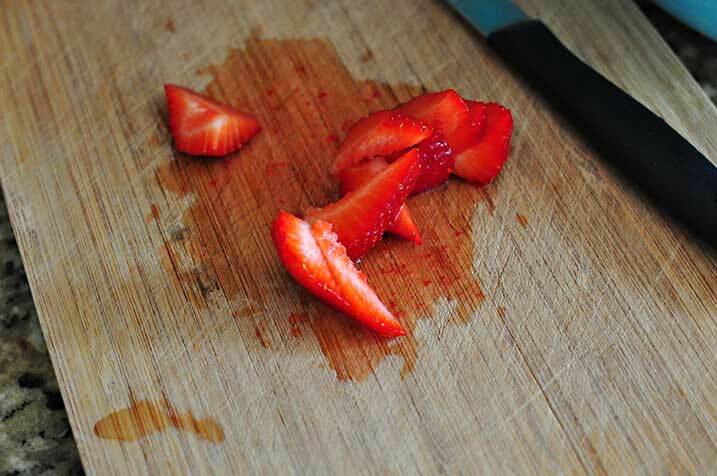 Cut strawberries into small pieces. About half inch by half inch by one inch. 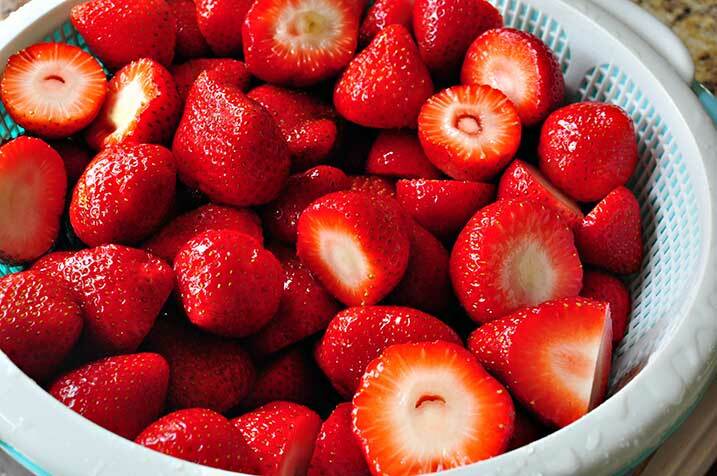 Place strawberries in large pot with 1/2 cup brown sugar and 1/2 cup of white sugar. Cook jam for about 20 to 30 minutes, until jam thickens. Remove from heat and follow canning instructions that come with your mason jars. If you are going to eat jam right away you do not need to heat seal the mason jars. 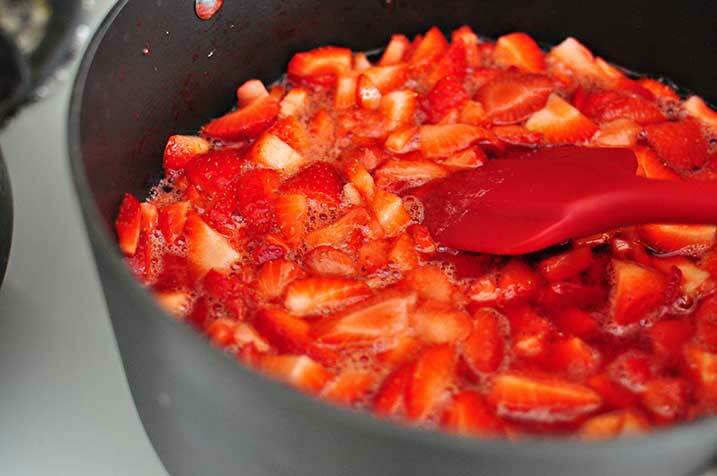 Combine the sugar and strawberries in a large pot and cook over medium heat for 20 minutes. 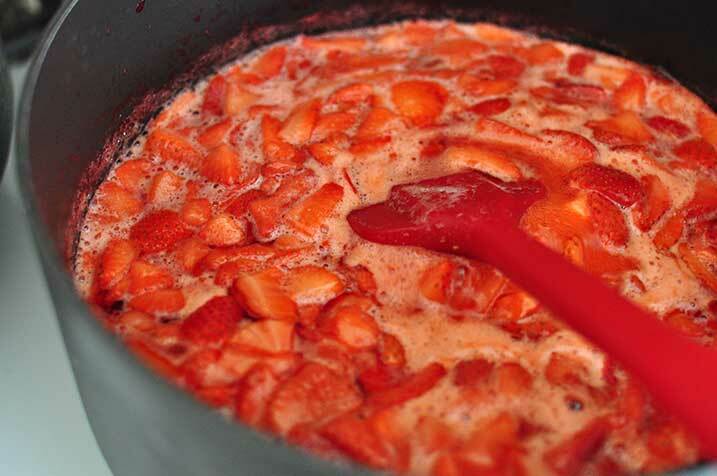 Cook until the strawberries reduce and thicken. Pour into canning jars and either seal or keep refrigerated. Use immediately, or follow canning instructions from your mason jar. *The usual ratio of sugar to strawberries is 1lb of strawberries to 1 cup of sugar. So for this recipe you could use 3 cups of sugar. I only used one cup total because I didn't want my jam too sweet. I saw an episode of Food Detectives a while back where Ted Allen mentioned that the best way to remove refrigerator odor was activated carbon. This was supposedly better than baking soda. 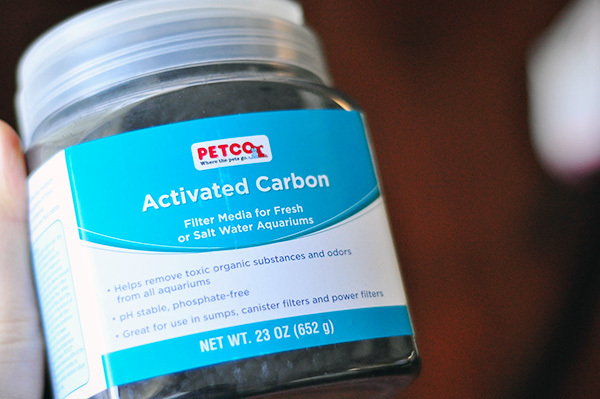 Activated carbon can be found at the local pet supply store in the fish area. I decided to give try this in our bathrooms. But instead of just putting a cupful out I put it in a mason jar and punched holes with our monogram in it, just to make it look more decorative. 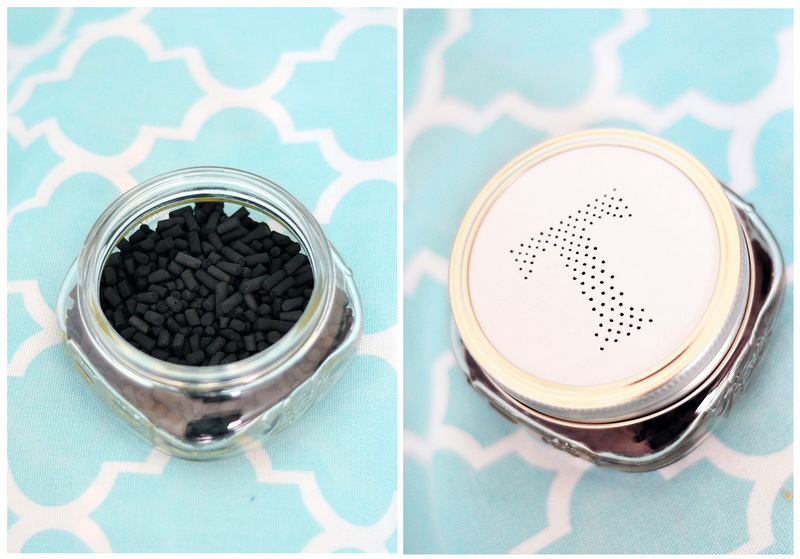 Don't mask odors with air fresheners, remove them. Activated carbon found at the pet supply store. 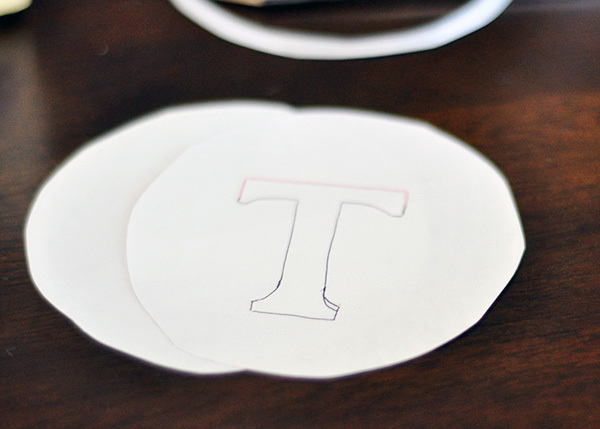 Cut out two circles from white paper. 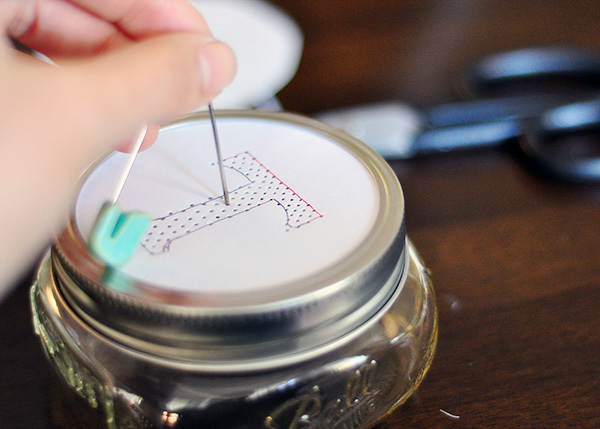 Trace out monogram for lid of mason jar. Using a pin push small holes. 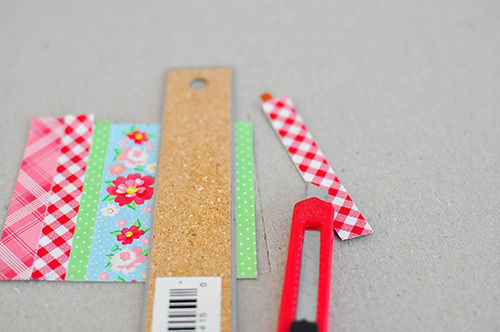 Remove top paper template. Removes odor better than baking soda. This post brought to you by Walmart. All opinions are 100% mine. Making breakfast in the morning is completely different when you have kids. Before I had kids, a cup of tea and maybe last nights pizza was a sufficient breakfast for me. Now that I have kids, I want to feed them something they will eat, that is also healthy and relatively fast to put together. I like using quick solutions and adding healty fruits and vegetables into the mix to make a great summer breakfast. Walmart sells Hungry Jack© Waffle and pancake mixes, which I love using. I add bananas, blueberries and/or strawberries into the mix make quick breakfast. They also sell syrup, but I usually skip the syrup as the fruit adds natural sweetness to the pancakes. Walmart also sells Martha White© Muffin Mix that you can hide carrots and zuchinni in. Make a batch and freeze them for a quick breakfast option. My daughter is in summer camp right now, so she really needs a good breakfast to hold her down for the day. Having something fast and "semi homemade" is always the best option for our busy mornings. It's much better than eating out or that left over pizza in the fridge! Walmart has all the delicious summer breakfast options you could ask for! All at amazing Walmart prices. Walmart has Folgers© Coffee, Hungry Jack© Mix (waffles/pancakes) and syrup, Smuckers© brand Jams, Jellies and Preserves and Martha White© Muffin Mix. The great thing about the these breakfast options from Walmart is that they are all quick to make and easy to enjoy and are all reasonably priced. I love custom things. I don't love paying the extra money for customization. 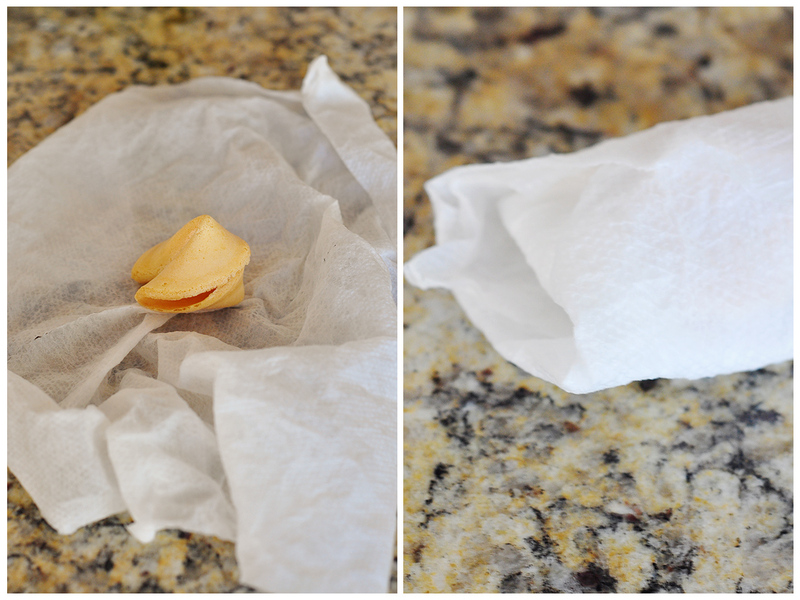 Here is a simple tutorial on how to take store bought fortune cookies, remove the fortune and add in your own. 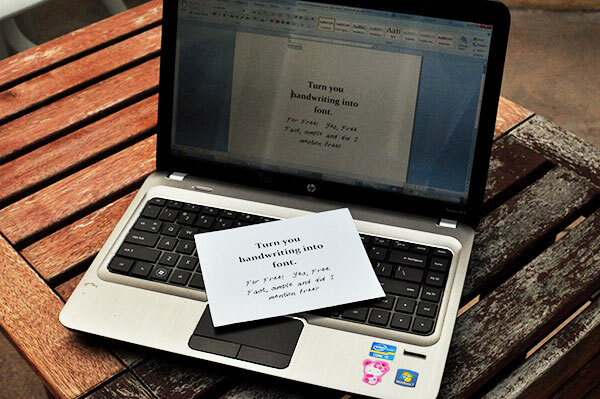 First print out custom fortunes using any text editor. I used the font Calibri in size 8. Wet a paper towel and ring slightly. You want the paper towel to be damp but not dripping wet. 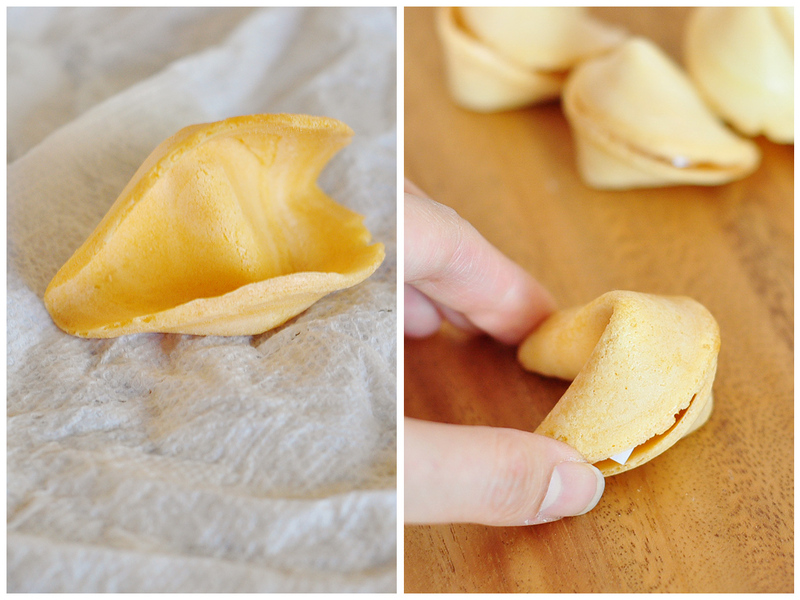 Wrap towel around fortune cookie and microwave for 20 seconds. Unwrap fortune cookie from towel carefully, towel may be hot. The fortune cookie should now be pliable enough to open. 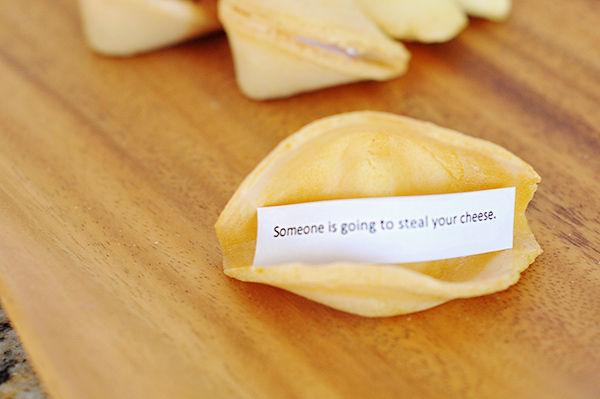 Quickly removed existing fortune cookie message and replace with your custom printed one. Reshape fortune cookie (should be fairly simple, as the cookie already has its form) and hold for 10 seconds to keep form. You want to do the last two steps quick, the fortune cookie cools very quickly. Wrap damp towel over fortune cookie and microwave for 20 seconds. 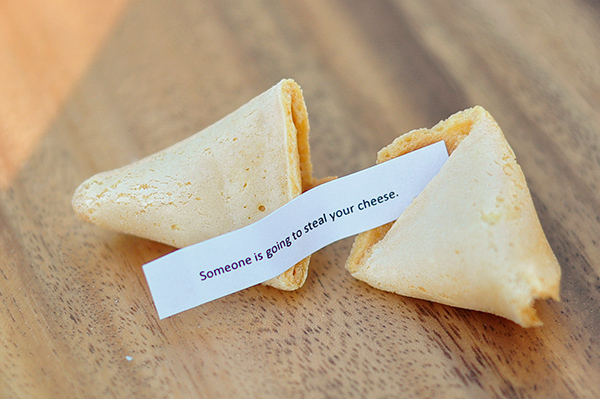 Open fortune cookie, insert message, hold closed for 10 seconds. Message in fortune cookie before closed. Stay tuned, the next post will be on how to customize these fortune cookies by dipping them in chocolate and adding a gumpaste flower. I mentioned it before, that I hate my handwriting. Hate is a strong word, I like my handwriting, but what I dislike most about it is that it is inconsistent. When I write a long paragraph it looks as though five different people wrote it. What I love about making my handwriting into font is that it makes my handwriting look better. I made a photobook for my daughter and wanted to use my handwriting as the font. After searching I found this awesome website that converts your handwriting to font for free! Who doesn't love free? And it couldn't be easier. 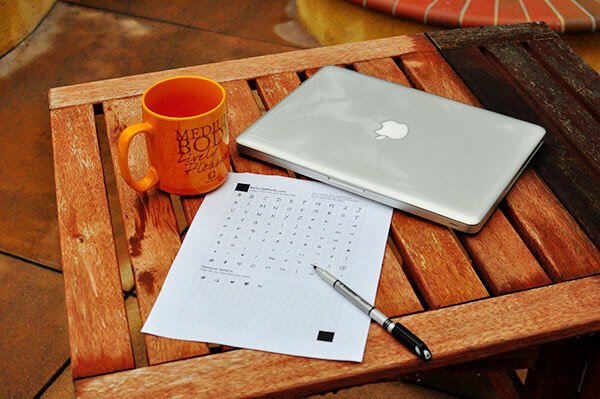 You simply download the template, fill it in, scan the template and upload back to the website. Within seconds you have your own handwriting font, easy peasy. I was not paid for this post, I just really wanted to share this cool site with my readers. There are other sites out there that can make your handwriting into font but most of them you have to pay for. This site may not have all the bells and whistles, but its free. You can add little doodles in the symbols fields also.